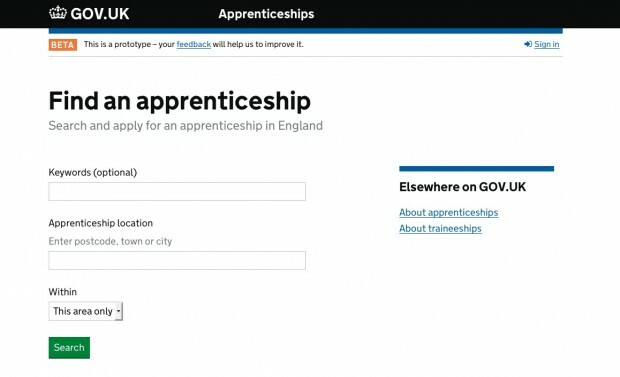 A few weeks ago, I went to Coventry to visit the Skills Funding Agency, where a team is working on a new online service to help young people in England apply for apprenticeships. Anyone over 16 and not in full-time education can apply for an apprenticeship. Sometimes a young worker will be offered the chance to convert to an apprenticeship by their existing employer, so not all apprenticeships begin with the online service. But even so, the online service handles 1.76 million applications every year 1. It’s an important part of the government’s policy on helping people find work after school or college. At the moment, making an application means using the existing web service which has been in place since 2008. That web service was not designed in a user-centric way, and sometimes causes problems of its own. 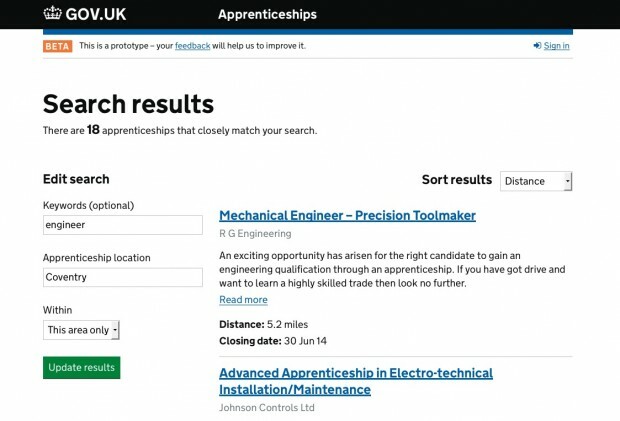 Searching for an apprenticeship vacancy is hard enough, because there are five different search types you can start with. The search results don’t always match what you’ve entered as a search term either (I tried searching for driving jobs, and got results including beauty therapist, hairdresser and solicitor’s receptionist). The registration process has problems too. The registration form collects data that isn’t needed. The form is too daunting for many people, because it presents them with a long list of questions. Lots of people drop out at this point. Of those who do register, around one in six never activate their account 2, because the activation email that gets sent to them often ends up in their email service’s spam or junk folder. They simplified the search input - the old system asks people to pick a search type (from a list including “keyword”, “occupation type” and “learning provider”), then enter keywords, then choose a location. Users find it confusing, because it asks for too much. The new service makes it easy to find out. It’s all about empathy, and understanding your users: in this case, about understanding that most potential apprentices are on a budget and can’t afford to travel far to take up an apprenticeship. The next step was to simplify the search output. There used to be seven different ways to sort the list of search results, but user research showed that most people only used two, and were usually most interested in what was geographically nearest. So now there are just two sorting options for search results, and distance is the default. They have also simplified the registration form. The new one asks fewer questions, and makes use of a more robust email system to help prevent messages being incorrectly tagged as spam. Rather than split information across several pages, the new service puts everything on one page. User research showed that people don’t mind scrolling - it’s what they expect to do. The new service lets people use their email address as a username, so that’s one less thing to remember. Researchers also realised that users are often sitting inside Jobcentres when they access the site, which means they don’t necessarily have easy access to their personal email account. Sending confirmation emails to them will only slow things down - so a future release of the service will be able to send confirmation messages by SMS, directly to users’ pockets wherever they are. Again, it’s all about empathy. That was really fast, it was good. You've just asked for the questions that are needed. This is clear and really useful, really quick to apply. It's really simple. 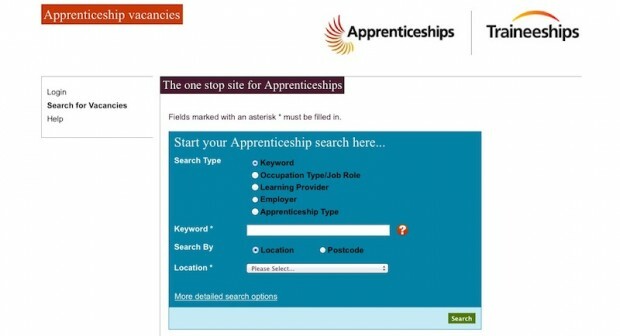 Even though apprenticeships themselves are quite difficult and hard to get, the site is simple and helpful. Our sixth Design Principle says: Build for inclusion. In more detail, it says: “In fact, the people who most need our services are often the people who find them hardest to use. If we think about those people at the beginning we should make a better site for everyone.” That’s what you can see happening here. As you might expect with a service handling hundreds of thousands of applications, the technology behind the scenes of the existing service is pretty complicated. It has a tightly integrated and hard-to-change architectural and system design, along with slow and infrequent deployment and release cycles. That leads to ‘high stakes’ product decisions, which in turn slow everything down. The new service has been designed to change all that, building a service with loosely-coupled components, making it easier to iterate and change. That’s a big step for the Skills Funding Agency, requiring them to take a radically different approach to both technology choices and service governance. The alpha successfully passed a Service Standard Assessment in April and officially moved to beta. The aim is to make a public beta release towards the end of this year. I said it on my visit, but I’ll repeat it here: well done, apprenticeships team. You’re doing exactly the right thing. This is how we imagined the transformation process working from the outset, and I’m delighted to see it actually happening. Just three years ago, even talking about this sort of radical change and service re-design would have been impossible. How far we’ve come, in such a short time. The team is small but their work has been noticed. 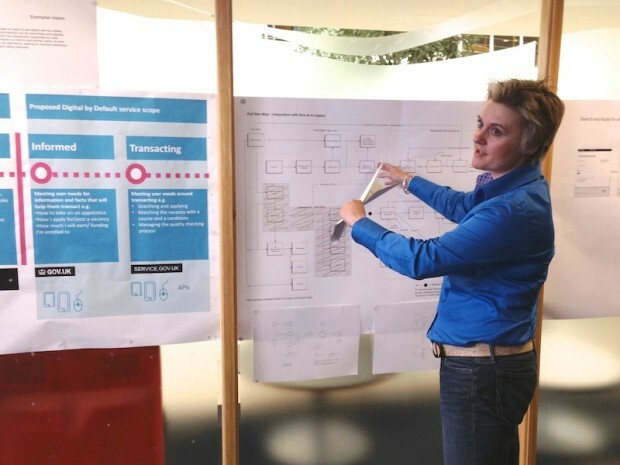 More and more people are attending their fortnightly show-and-tell sessions, and showing an interest in agile working. The team aims to do its work in the open, and it’s good to see that designer Scott Smallman and front-end developer Henry Charge have been strong contributors to the Design Patterns Hackpad, where teams from different service and project teams compare notes. The Skills Funding Agency has been undergoing some big changes recently, not least a reduction in staff numbers from 1,900 to 900. It’s been a difficult time. What’s exciting, though, is that the management can see the need to hire people with digital skills. They’re desperate to recruit more people and have ambitious digital plans, but progress to date has been slowed by the restructure and reform programme. Good point. I’ve said it before: London is not the only place where you find skilled digital people. There are excellent digital people in every corner of the UK, and I’m sure there are many in and around Coventry who could help the apprenticeships team build a better digital service. Government needs to get better at getting those people in - either as civil servants, or as temporary contractors. If that means changing some rules that have been in place for years, so be it. It’s no good saying we’re going to do the hard work to make it simple if there aren’t enough of the right people on the team to get that hard work done. I’ll do whatever I can to help the agency build the team it needs.